Lately I’ve been listening more closely to music. Whether it’s a live performance or a studio recording, I’m taking special note of production techniques used. There’s a lot you can learn from listening to how others have arranged their songs. Even if you’re attending a concert, what are the bands doing musically that captures your attention? What is it about the arrangement of the song that makes you keep listening? It’s good to ask these questions. As you answer them, you’ll discover more and more tricks that you can use in your own productions to keep them interesting, engaging, and awesome. Whenever I’m recording an electric guitar part, I almost always record the part once, then quickly record it again on another track. I’ll do the same thing for acoustic guitar. There’s nothing wrong with doubling a part. It can be an effective way to create width in your mix, but is there a better way? Think back to that awesome concert you attended. Did both electric guitarists play the exactly same part? I highly doubt it. I bet one of them played the rhythm part while other played something different, either a more melodic part, or different voicings of the same chords. If both guitarists played exactly the same parts for the entire show, you’d end up with a really boring show. Why? Because there’s no texture, nothing to really capture your interest, nothing to make you look back and forth from one musician to another. Does this describe your mixes? 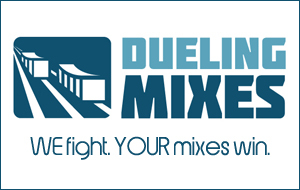 Are your mixes a bit sterile and boring? Do you have a hard time keeping them interesting for the full length of the song? Perhaps your problem is that you have too much of a good thing. That electric guitar part was amazing, so you doubled it. You liked the sound of that B3, so you added a synth part playing the same notes. You liked that drum fill, so you copied and pasted it to every other drum fill in the song. Don’t forget about your most important ally in production – SILENCE. It’s okay for the lead guitarist to stop playing during the verses. It’s okay if the instruments drop out entirely after the bridge, leaving just a piano and vocals. It’s okay if your mix is left-heavy during the verse and fills out during the chorus. Imagine that your mix is a live show. You want your audience to be engaged. You want them to be interested in every member of the band. You want them to constantly look back and forth from one band member to the next, constantly finding something new and interesting to listen to.